Yu-Gi-Oh! is a strategic trading card game in which two players Duel each other using a variety of Monster, Spell, and Trap Cards to defeat their opponent's monsters and be the first to drop the other's Life Points to 0.Card Name: Number C6: Chronomaly Chaos AtlandisCard Type: Xyz MonsterCard Number: PGLD-EN018Set: Premium GoldAttribute: LightLevel: 7Monster Type: Machine/Xyz/EffectCard Text: 3 Level 7 monsters If you activate any of this card's effects, your opponent takes no damage for the rest of this turn. Once per turn: You can target 1 monster your opponent controls; equip it to this card. 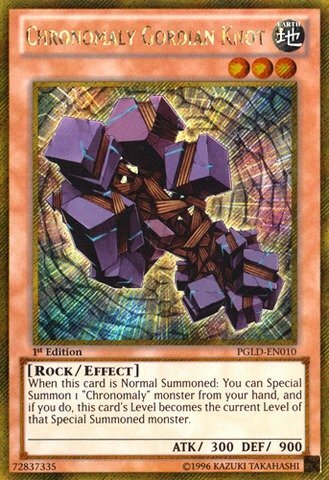 This card gains 1000 ATK for each monster equipped to it by this effect. 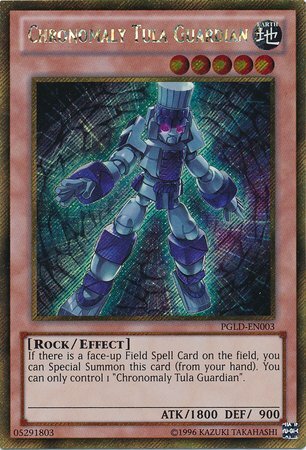 If this card has "Number 6: Chronomaly Atlandis" as an Xyz Material, it gains this effect. 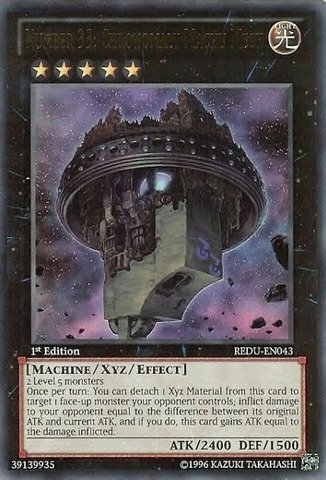 You can detach 3 Xyz Materials from this card, then send all "Number" monsters (min. 1) equipped to this card by its own effect to the Graveyard; your opponent's Life Points become 100. Yu-Gi-Oh! is a strategic trading card game in which two players Duel each other using a variety of Monster, Spell, and Trap Cards to defeat their opponent's monsters and be the first to drop the other's Life Points to 0.Card Name: Number 6: Chronomaly AtlandisCard Type: Xyz/Effect MonsterCard Number: YS13-ENV11Set: Super Starter Power-Up PackAttribute: LightLevel: 6Monster Type: MachinePasscode: 09161357Card Text: 2 Level 6 monstersWhen this card is Xyz Summoned: You can target 1 "Number" monster in your Graveyard; equip that target to this card. This card gains ATK equal to half the ATK of that equipped monster. 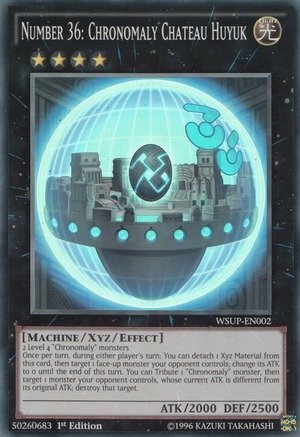 Once per turn: You can detach 1 Xyz Material from this card to send the monster equipped by this effect to the Graveyard; halve your opponent's Life Points. You cannot conduct your Battle Phase the turn you activate this effect. Yu-Gi-Oh! 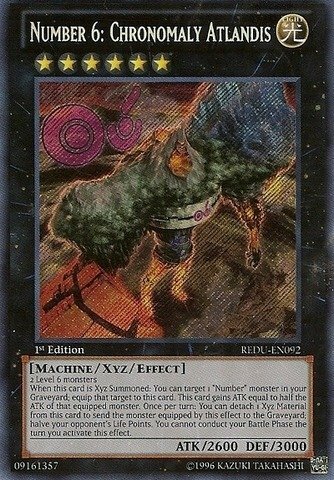 is a strategic trading card game in which two players Duel each other using a variety of Monster, Spell, and Trap Cards to defeat their opponent's monsters and be the first to drop the other's Life Points to 0.Card Name: Number 33: Chronomaly Machu MechCard Type: Xyz/Effect MonsterCard Number: REDU-EN043Set: Return of the DuelistAttack/Defense: 2400/1500Attribute: LightLevel: 5Monster Type: MachinePasscode: 39139935Card Text: 2 Level 5 monstersOnce per turn: You can detach 1 Xyz Material from this card to target 1 face-up monster your opponent controls; inflict damage to your opponent equal to the difference between its original ATK and current ATK, and if you do, this card gains ATK equal to the damage inflicted. Yu-Gi-Oh! is a strategic trading card game in which two players Duel each other using a variety of Monster, Spell, and Trap Cards to defeat their opponent's monsters and be the first to drop the other's Life Points to 0.Card Name: Chronomaly Mayan MachineCard Type: Effect MonsterCard Number: REDU-EN009Set: Return of the DuelistAttack/Defense: 1500/700Attribute: EarthLevel: 3Monster Type: MachinePasscode: 25163248Card Text: This card can be treated as 2 Tributes for the Tribute Summon of a Machine-Type monster. Yu-Gi-Oh! is a strategic trading card game in which two players Duel each other using a variety of Monster, Spell, and Trap Cards to defeat their opponent's monsters and be the first to drop the other's Life Points to 0.Card Name: Number 36: Chronomaly Chateau HuyukCard Type: Xyz MonsterCard Number: WSUP-EN002Set: World SuperstarsAttribute: LightLevel: 4Monster Type: MachinePasscode: 50260683Card Text: 2 Level 4 "Chronomaly" monsters Once per turn, during either player's turn: You can detach 1 Xyz Material from this card, then target 1 face-up monster your opponent controls; change its ATK to 0 until the end of this turn. You can Tribute 1 "Chronomaly" monster, then target 1 monster your opponent controls, whose current ATK is different from its original ATK; destroy that target. Yu-Gi-Oh! is a strategic trading card game in which two players Duel each other using a variety of Monster, Spell, and Trap Cards to defeat their opponent's monsters and be the first to drop the other's Life Points to 0.Card Name: Number 6: Chronomaly AtlandisCard Type: Xyz/Effect MonsterCard Number: REDU-EN092Set: Return of the DuelistAttack/Defense: 2600/3000Attribute: LightLevel: 6Monster Type: MachinePasscode: 9161357Card Text: 2 Level 6 monstersWhen this card is Xyz Summoned: You can target 1 "Number" monster in your Graveyard; equip that target to this card. This card gains ATK equal to half the ATK of the equipped monster. 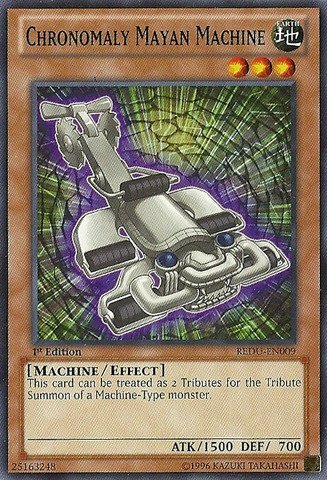 Once per turn: You can detach 1 Xyz Material from this card to send the monster equipped by this effect to the Graveyard; halve your opponent's Life Points. You cannot conduct your Battle Phase the turn you activate this effect. Yu-Gi-Oh! is a strategic trading card game in which two players Duel each other using a variety of Monster, Spell, and Trap Cards to defeat their opponent's monsters and be the first to drop the other's Life Points to 0.Card Name: Chronomaly Tula GuardianCard Type: Effect MonsterCard Number: PGLD-EN003Set: Premium GoldAttribute: EarthLevel: 5Monster Type: Rock/EffectCard Text: If a Field Spell Card is face-up on the field, you can Special Summon this card (from your hand). You can only control 1 "Chronomaly Tula Guardian". 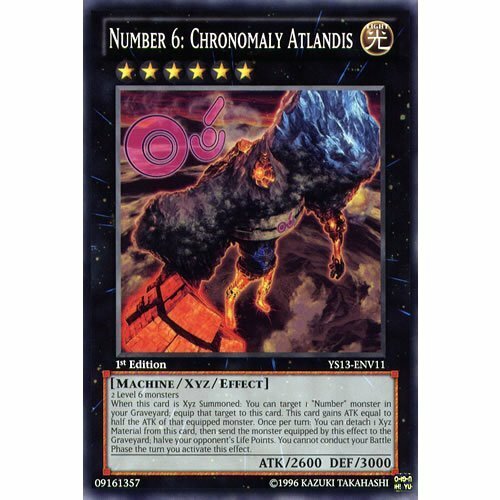 1 x Number 6: Chronomaly Atlandis 1st Edition Common Card (YS13-ENV11);Level: 3, Attribute: Earth, Type: Xyz Effect Monster, SubType: Zombie;ATK: 300, DEF: 300;Card Text: 2 Level 6 monsters. 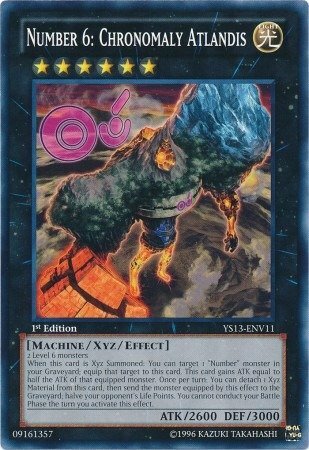 When this card is Xyz Summoned: You can target 1 Number monster in your Graveyard; equip that target to this card. This card gains ATK equal to half the ATK of that equipped monster. 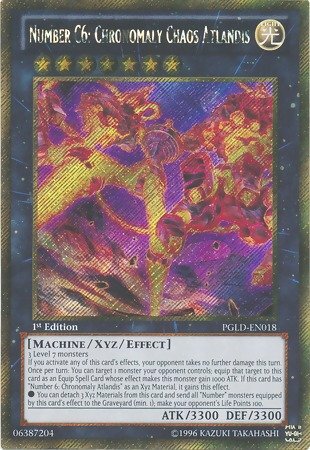 Once per turn: You can detach 1 Xyz Material from this card to send the monster equipped by this effect to the Graveyard; halve your opponent's Life Points. You cannot conduct your Battle Phase the turn you activate this effect. ;Card is Mint taken straight from pack. Yu-Gi-Oh! is a strategic trading card game in which two players Duel each other using a variety of Monster, Spell, and Trap Cards to defeat their opponent's monsters and be the first to drop the other's Life Points to 0.Card Name: Chronomaly Gordian KnowCard Type: Effect MonsterCard Number: PGLD-EN010Set: Premium GoldAttribute: EarthLevel: 3Monster Type: Rock/EffectCard Text: When this card is Normal Summoned: You can Special Summon 1 "Chronomaly" monster from your hand, and if you do, this card's Level becomes the Summoned monster's Level. Compare prices on Chronomaly Cards at ShoppinGent.com – use promo codes and coupons for best offers and deals. Start smart buying with ShoppinGent.com right now and choose your golden price on every purchase.